What the heck is Surgical Tech Magic Dust? If you give me just three minutes of your time right this very second, I promise you this article may just change your life! AND I have something for you that can propel your surgical career to an entirely new level & it won't cost you a single penny to get started. Chances are, if you're visiting this website, you are looking for a way to improve your current career or student situation. You know, I talk to a lot of people every single day about becoming a surgical professional and ways to advance their career. I mean, I have conversations with professionals & non-professionals on all levels (in & outside of the medical field) who are just not happy with their current work, career, and even life situation. Some of the people I speak with are unemployed looking for a new career, some of the people I speak with are new ST grads looking for that first job, and some of the people I speak with are seasoned surgical tech veterans looking for a route to move up the career ladder. Ok, ok, so I talk to a lot of people....and you might be saying, well what's the point here..??.. Well, my point is that I hear things on every single career, student, and experienced professional level that you can possibly imagine. AND to be quite honest, most of the people I speak to are motivated to move forward and continue to grow into a professional level that will help propel them through the career portion of their life. I love speaking with people in general but I particularly love hearing the excitement during the conversations I have with the indivuals who have the attitude that they are going to do what it takes to move their career forward. Yep, these people have that "nothing can stop me" attitude and they are going to work the process until they reach their goals. You see, there are a lot of people out there who want to move up the professional ladder but they don't want to go through "the climb" to get to the top of the ladder. There are people out there who approach the career ladder, take a good look at where they want to be, and then they just want to be boosted all the way to the top while skipping the steps in between. AND, once they realize they just can't skip the steps to climb to the top of the career ladder, they move on looking for another shortcut that inevitably leads them right back to the first step of that ladder. looking for some sort of MAGIC DUST. I KNOW this sounds a bit nutty, but PLEASE read on....it's PURE! 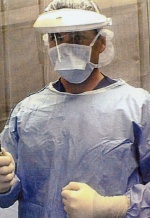 Hmmm, if I just sprinkled a little magic dust over my head as I approach my first day in surgical tech school, I'd automatically walk out as a certified ST with years of experience under my belt and I'd be the lead cardiothoracic SurgTech at the worlds most advanced robotic surgical laser facility. Then I'd take my magic dust and call the first assist school, get the info, hang up the phone, sprinkle a little more magic dust over my shoulders, and wa-la, I'd be a certified first assistant with my billing company in place making me 10 bazillion dollars a year. AND to think, I did all this in a matter of just two days with a little jar of magic dust. OK, OK,... please forgive me for my warped sense of humor and socially inept sarcasm. Although I am trying to be a bit humorous here, the reality of what I'm saying is true. You see, there are a lot of people out there who really do look for that shortcut (magic dust) to a professional career in surgery. BUT, for some reason, plenty of people find out that there is a little process or work involved and they just don't want to put in the effort or time required. Listen to me please, you know I speak from the heart and these articles are not what you might find in a brain surgery text book or something meant to sound like a hundred page contract full of tiny font & giant words that only make sense to a law professor. NO, I speak from my heart & decades of surgical/medical career experience AND I simply want you to avoid the mistakes I've made. AND to be successful in surgery you have got to be willing to go through the process of being successful in surgery. Trust me, if I would have known someone like me 20 years ago, I wouldn't have made the mistakes I made in the first 10 years of my surgical career. PHEW..., sorry about getting a little emotional here but I just don't want you to make the same mistakes I made over a 10 year period of the first part of my surgical career. Do whatever it takes & go through the process (legally & honestly) to move yourself up the career ladder. Develop a plan, commit to it, and work it. 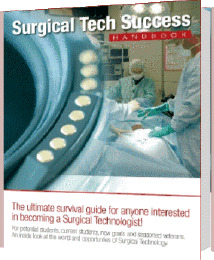 If you're on the fence about surgical tech school, jump in & start moving forward. MY motivation & goal is to help YOU become Successful! We can all learn something from someone who's been there and done that. But there is a process and there is no magic dust or shortcuts to get through the process. Time will continue to fly by whether you take the step to move toward your goals or not. If you can visualize the last 5 years of your life, it probably seems like yesterday. Don't let time or a lack of motivation prevent you from working the process and getting to be where you are meant to be. FINALLY, as I mentioned at the beginning of this article. I have something for you that can propel your surgical career to an entirely new level & it won't cost you a single penny to get started. If you want to get into first assistant training but just don't have any money to get started, well, GREAT NEWS! I recently had a meeting with the CEO of the FA school I promote and he agreed to a ZERO DOWN enrollment fee. Yep, you can start your first assistant training with absolutely no money up front! Please shoot me an email with your thoughts on this article. I enjoy your feedback - good or bad - I love it all!